Kerry, only the third U.S. secretary of state to visit Cambodia since John Foster Dulles in 1955 and Hillary Clinton in 2012, was responding to a question whether Laos would take a strong line on territorial disputes in the South China Sea as ASEAN chair. 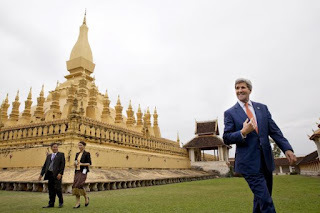 Laos has close political and economic ties with giant neighbor China, prompting the Obama administration to worry that Vientiane might behave like Cambodia did when it held the ASEAN chair in 2012. Cambodia was accused of obstructing consensus in the bloc over standing up to China's assertive pursuit of its South China Sea claims, which have since included the building of artificial islands suitable for military use. "It is particularly important that Laos finds itself playing a critical role within ASEAN, and ASEAN itself is critical to upholding the rules-based system in the Asia-Pacific and ensuring that every country, big and small, has a say in addressing the matters of shared concern," Kerry said. "We want everybody to have a voice within the region without regards to size, power and clout."